This site contains automotive air conditioning service and repair information. It also contains automotive cooling system service and repair information. It is intended to provide a shared source of information for technicians. to do with automotive air conditioning and/or cooling systems. Links to automotive related web sites (my collected list). This page discribes how an automotive air conditioner works along with thermodynamic principles and refrigerant characteristics. This is my index page of automotive air conditioning service and retrofit information. The information comes from sources like the EPA, OEM (Original Equipment Manufacturers), aftermarket manufacturers (Everco, Four Seasons, and Murray) and air conditioning repair shops like mine. I have run an air conditioning and radiator shop for over 25 years. This page contains automotive cooling system service and repair information. This page includes automotive air conditioning and cooling system documents. A customer air conditioning information sheet. An automotive air conditioning diagnostic check list and estimate work sheet. An automotive cooling system diagnostic check lists and estimate work sheet. Automotive electrical repair and service information. This page is under construction. Automotive air conditioning and cooling system parts supplier (vendor) information. This information includes current price data and cross-reference data from Four Seasons, Modine and Gates. This page provides information on automotive software (computer programs) used to run a small automotive repair and service business. The programs include estimating programs and point of sale programs. A point of sale program is used at the point of sale and tracks information from the sales invoices. I use a point of sale program called THE GENERAL STORE. Tips and tricks for automotive air conditioning and cooling system repair and service. 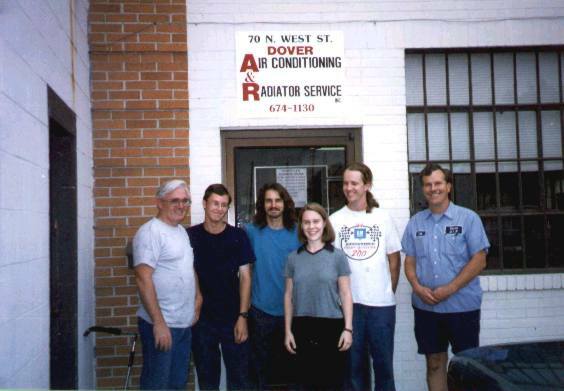 My tips are from 23 years of automotive air conditioning and radiator service experience. Any additional tips will be listed with the providers' name and address if permission is granted. Information that might help you run a small business with a personal computer (IBM compatible computer). Learn HTML by example. This page has information on the use of HTML (HyperText Markup Language). It has HTML examples, templates and tips that might help you with a web site. The image at the top of this web page and the blue line were created with Paint Shop Pro. The rest was created using a text editor. You can save a web page and then enter your own data. To get a better idea of how to write web page, view a web page and the code used to create it. This page includes forms that can be filled out to search the net. Please do not use this page from my web site, other than to test it. If you like it you can save and bookmark this page to your computer for future use. Just choose "File" then "Save" noting the file location. Pages like this will work fastest when on your computer. This gives you a table of contents on the left side of the screen. If you have a large monitor, frames look good.